July 4th is quickly approaching. 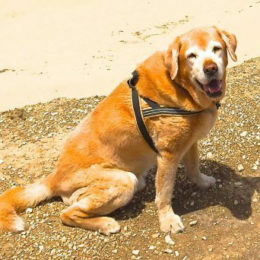 It can be a fun holiday for children and adults, but most dogs don’t share their enthusiasm. In fact, almost all people with dogs in the U.S. declare this day the worst day of the year for their dogs. Veterinarians say July 3rd is usually the most trafficked day in their clinics, with clients coming in to get drugs for their dogs. July 5th tends to be the busiest day of the year for shelters. 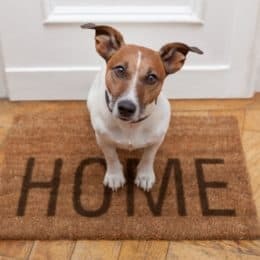 Dogs become Houdini when they hear fireworks and escape from their yards that appear perfectly secure other days of the year. A tired dog is a happy dog. 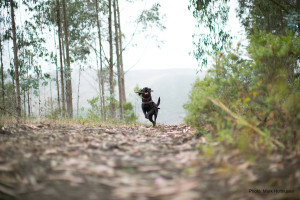 Take your dog for a big hike early in the day. Play fetch with him. Enjoy some training time together. Tug with her. These are all things that will tire her out before the fireworks begin, so she has less ability to focus on the disturbing noise. Keep your dogs inside during fireworks, preferably with human companionship. Bringing your dogs to a fireworks display is never a good idea. 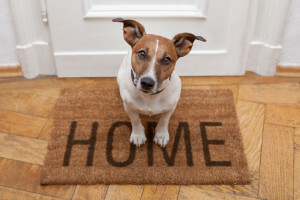 Instead, provide a safe place inside for your dogs to retreat. When scared of sounds they can’t orient, dogs often prefer small enclosed areas. I once had a dog who climbed into the bathtub during windstorms. Keep your windows and curtains closed. Covering their crate and lowering the blinds can also be helpful. Removing visual stimulation has been known to calm dogs. Give your dog something fun to do that is distracting. Dogs enjoy the challenges of food puzzles. Feed him his dinner in a food puzzle. Freeze a kong with his favorite treats in the morning. For dessert, hand him the kong just when the fireworks start. He may even start to associate fireworks with yummy treats. 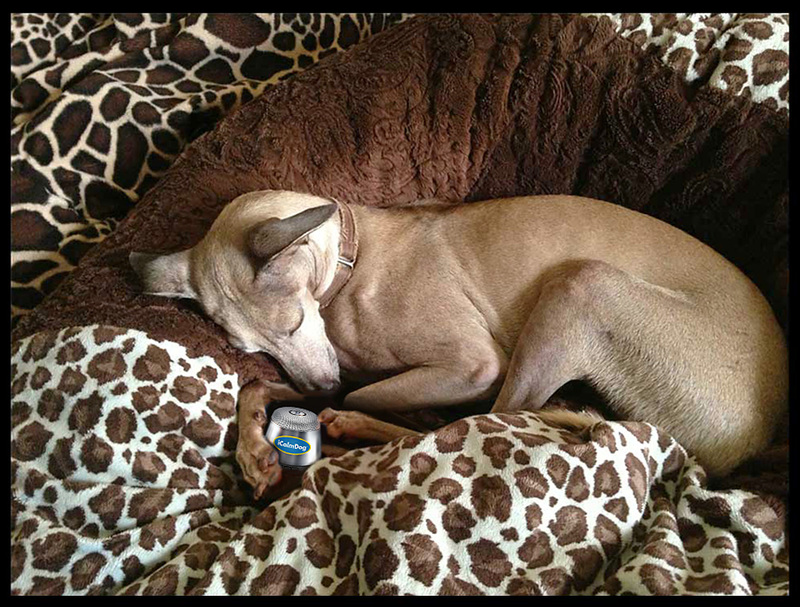 Rescued Italian Greyhound Cyrus listens to his iCalmDog, or is it his iPawd? 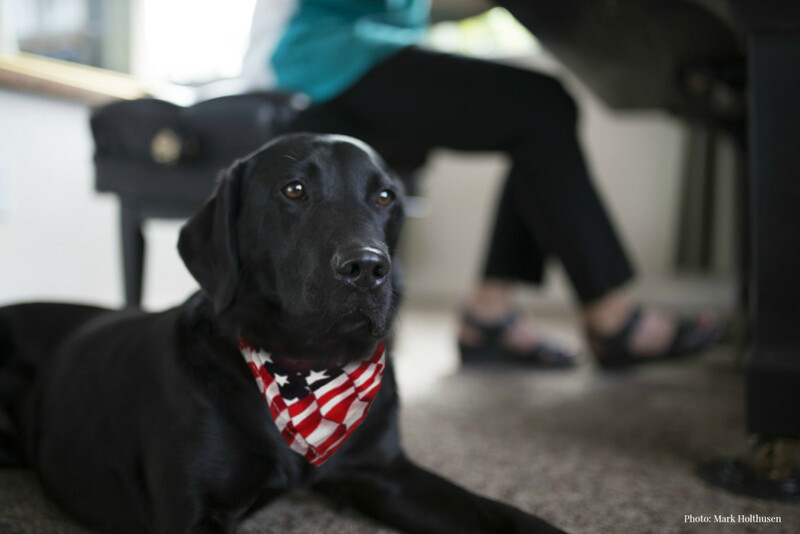 Canine sound therapy can be a huge help for dogs afraid of fireworks. The rearranged classical compositions of Through a Dog’s Ear have been clinically shown to reduce canine anxiety, including fireworks phobia. As the pianist on the music series, it warms my heart hearing all the ways the music comforts dogs during stressful times. Halle even stopped jumping out of 12 foot high windows on July 4th once she discovered canine sound therapy. 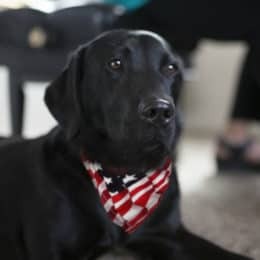 Some dogs also benefit from desensitization training programs that help them build a positive association to fireworks. We offer a variety of Fireworks Prep calming tools. There are two canine wraps on the market that reportedly help sound phobic dogs. 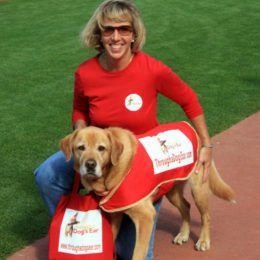 The original Anxiety Wrap was created by professional dog trainer Susan Sharpe, CPDT-KA. The patented design uses acupressure and maintained pressure to reduce stress. Thundershirt is also a wrap for dogs that provides gentle, constant pressure. Many dog lovers use one of these wraps in combination with canine sound therapy. 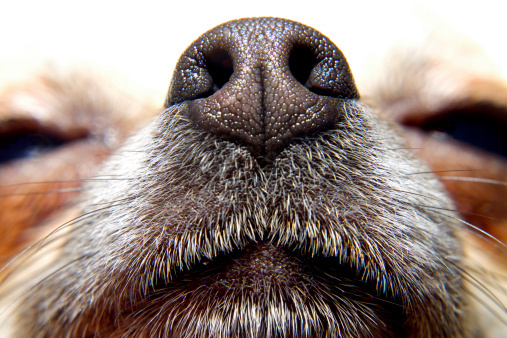 Calm Aroma Mist can help dogs relax and cope more effectively with loud noises and other stressful situations. Spray Calm Aroma Mist in the room and on your dog’s crate. It’s equally enjoyable and calming for people. Do you have any additional tips for helping keep dogs calm and safe on this noisy holiday? Thanks for sharing your suggestions in a comment below. 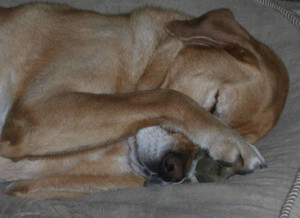 And feel free to share how your dogs have responded to fireworks on previous holidays. 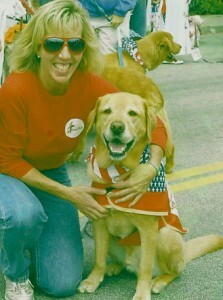 Sanchez, Gina and I wish you and your canine household a calm and safe 4th of July! Previous post: Do You Celebrate Your Dog’s Birthday or Gotcha Day? Great info. I’ll try the advice with my rescue dogs. Great Cindy. Wishing you a peaceful, calm July 4th with our rescues. My guys are super sound sensative. Thank you for the great tips ! Jeanne – You are welcome. Let me know how they work out. to be prepared just in case! Thanks for the tips! Ours will hide under the bed. I make big bag of popcorn.. My lab comes over and waits patiently for a piece every minute or so. It’s been a nice distraction and soothes him. Our dog has a HUGE storm phobia. She is 8 years old and I have been told not trainable anymore.We think she is lab/shepherd mix. We have a thunder shirt and we give the strongest pills the vet gives. Nothing seems to work. While at work a couple of months ago she destroyed almost every blind in our home and there was blood everywhere. Looked like a crime scene. We don’t know what else to do. Do you think the sound would help? Bonnie – Yes, while there is no one thing that works for every dog, Through a Dog’s Ear has helped thousands with equally bad storm phobia. You might want to also check out our Canine Noise Phobia Series. It includes desensitization training protocol by Victoria Stilwell plus our clinically tested calming soundtracks. It’s available in CD format and for the iCalmDog. and turn on classical music. That is music to my ears Brenda. Which recording to you have? Have a peaceful, calm 4th! Nothing works except putting them in the car and riding around. Yes, its hours in the car for me, but it protects them from the terror. Bach’s Rescue Remedy for canines. Works great. All natural. Can’t overdose. I put a dropperful in the palm of my hand and my dog laps it up. Available at health food stores or online. People version too. Calmed my daughter-in-laws panic attack in a very short time. I swear by it! So glad I found this before the 4th! Some real great suggestions and I will be sure to try on our slightly nervous Lab. Jenny – Let me know how it works out. I got some plastic bubble wrap and showed it to my dogs. They sniffed it and then I popped a couple of bubbles. I did this several times. Now I will pull out the bubble wrap at various times of the day. They don’t even come to check it out any more and continue to play or eat, etch. I have been doing this for a couple of weeks. The real test will be on the 4th. I will let you know if it helped. When I first took my Gizmo in, I sat with him and kept my hand on him as much as I could. Now when he gets any anxiety, he comes and sits by me and I put my hand on him. That calms him. He also has found a special spot on my bed where he stays when I am not home. The same works while traveling and also playing the CD from Through A Dogs Ear. Dale – That is so sweet. You sound like such a caring, sound aware pet parent. We use the music in conjunction with a thundershirt and Nutricalm to reduce stress during thunderstorms and fireworks. Love your music! Love how it relaxes Lexi! 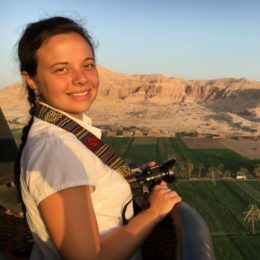 Gloria – Thanks so much for sharing Lexi’s story. I love that you can both nap to the music! Thank you for reminding me about the thundershirt. That’s what we used before I found you. I’ll try them together for the 4th. To others who are skeptical: although my dog wasn’t destructive, he became terrified as soon as rain would start…not even the thunder…the rain! 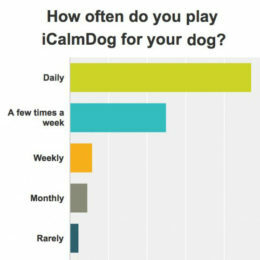 Using the iCalmDog stopped the constant pacing, panting, and trembling. Even though he has not yet gotten to the point where he can sleep through the storms, this product has made SUCH a difference to how he handles them. I’m very thankful that my research led me to Lisa’s beautiful music. So glad you found us Patty. I’m so thrilled that iCalmDog has been such a big help. Fireworks in our neighborhood are year round. The worst is the summer. I was just in the backyard with my Lab and someone on the next block shot off a blockbuster. Both my dog and I came unglued…now she won’t go out. I tried Thundershirt, Calming Collar, your CD’s (not loud enough to drown out the “war zone” and the worst is that I never know what’s going to blow up and when. I turn the a/c on, fan, tv anything..but they also feel the percussion and the noise is deafening. This is the first dog I have had with noise phobia and I am at my whits end. The only thing that takes the edge off is Xanax but I only reserve that for the day and night of the 4th. If you have any other suggestions I would appreciate it. Thank you. 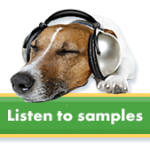 It’s a combination of our clinically tested calming canine music, progressive fireworks sounds, and training by famed trainer Victoria Stilwell. 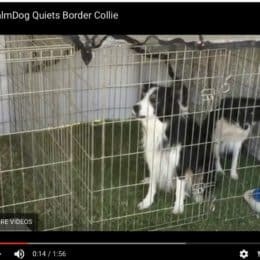 It’s helped thousands of dogs. We leave the TV on a little louder than usual and hide treats all over the house ( little tiny dog treats). Our baby is used to western movies with gun noise and unless it is a house shaking thunder he is fine. I have a Boston terrier that never reacted to anything noisy – thunder fireworks nothing. Then we moved to Hawaii where there was No restrictions on fireworks. And it’s a big Asian tradition to light off tons of firecrackers and our dog just couldn’t handle it and 6 yrs later is still not cool with them. We def listen to your music and throw in a thunder shirt and a few blankets and pillows down on the floor of the walk in closet we actually have a fun little campout ! The Thundershirt works for my dog. I’m also trying classical music. It’s a huge adjustment this year as we moved 3 weeks ago and he’s losing his eye sight to cataracts brought on by diabetes. Thank you for the interesting suggestions. We used to give our dog calming drugs from our vet, I did not care for them because the dog was just doped up. I read recently that all the drugs do is incapacitate them and that they still have the fear but now cannot do anything about it. I also heard the best remedy is to hold your dog firmly around his underside (same idea as the thunder shirt but more personal. You hold them close to your heart while talking in a calming voice. After a few minutes our dog calms down but I keep holding him. I think your music CD would be a welcomed addition. I have tried every available remedy, and the one that has worked better than any other (and in conjunction with the soothing music is Perelandra. A couple of droppers of this stuff works wonders in a few minutes. It is a blend of flower essential oils (from Hawaii), is not cheap, but I can tell you, it works on my BC, and cats! No stress.